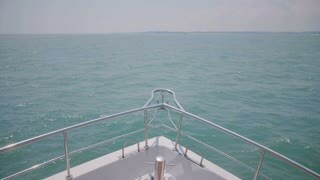 Search Results for "woman yacht"
Beautiful slow motion back view shot of happy tourist woman standing on yacht boat nose front during sunny sea cruise. 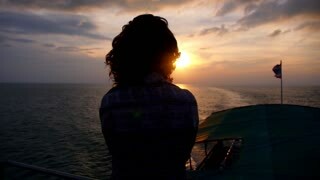 Sunset and Silhouette of Woman on Deck of Sailing Yacht. Slow Motion. 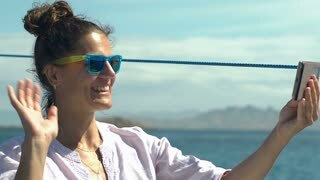 Happy successful Caucasian tourist woman walks up to cruise yacht boat nose to enjoy amazing sunny sea sail on vacation. Woman Taking Picture on a Yacht with Cell Phone. Slow Motion. Beautiful medium shot portrait of happy young beautiful tourist woman posing in sun hat on sea yacht sailing on cruise. Woman Silhouette at Sunset on Sailing Yacht Bow. Slow Motion. 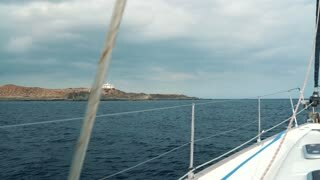 Beautiful Woman Enjoying Romantic Seascape on Luxury Yacht. Slow Motion. Happy young tourist woman holds her hat on cruise yacht boat nose enjoying perfect windy sunny sea sail on vacation. Woman Wearing Sea Sailor T-shirt on Yacht Using Cell Phone. Beautiful close-up back view of happy excited tourist woman in old sun hat enjoying sunny sail on sea yacht boat front. Blur Silhouette of a Young Woman Playing with Her Hair at Sunrise Sailing on a Yacht. Slow Motion. 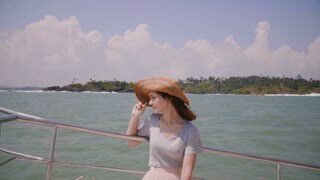 Happy young beautiful tourist woman enjoying amazing view of exotic coast on sea cruise yacht trip on a sunny vacation.